The Lincoln Park Zoo, home to wild and exotic animals, is an unorthodox leader in conservation of native plants, animals and insects in Chicago, but with the opening of the Nature Boardwalk at the Lincoln Park Zoo it is becoming just that. After an 18 month renovation that saw the south pond drained and dredges the Nature Boardwalk opened to the public this summer. The south pond's transformation into the Nature Boardwalk is creating a haven for native plants, birds, frogs, fish, turtles and insects along Chicago's lakefront. This new model of conservation goes beyond stodgy model preserves and restorations to create an outdoor classroom-a living laboratory, if you will. As a gardener the Lincoln Park Zoo has held little interest for me. So I was curious when Brian Houck, Director of Horticulture, invited me to audit a native plant gardening class at the zoo this summer. A native plant gardening class at a zoo? “Isn’t the Lincoln Park Zoo a place for little kids to take field trips and nannies to stretch their legs between meals and picking up toys?” I thought to myself. Apparently not as I soon discovered. The south pond of the Lincoln Park Zoo, created after the Civil War, had become a murky breeding ground for mosquitoes before the restoration. Walking the boardwalk it was hard to remember what it looked like before the transformation. The native plant gardening class developed by Houck and co-presented with Joe Wiltjer, Ecological Restoration Technician at McGinty Bros., Inc., had been developed for beginner gardeners in mind. Along with species and genus information the students learned about selecting native plants according to their site. This information was illustrated to us students during the second-half of each class when we walked the Nature Boardwalk and got to see the plants in person situated in locations we had learned in class they’d grow best. As someone who has an interest in native plants, but not enough education, I found this particularly useful. Following a landscape plan designed by WRD Environmental Joe Wiltjer planted ninety thousand plugs across the 14 acres of the south pond. Planting a garden can be a difficult enough, but the job is even more daunting when you consider the upland, submergent and riparian may have to be shuffled around because the pond was drained at the time of planting. Along with the ninety thousand plugs of native plants they spread between two and three hundred pounds of native plant seeds. Because of the Nature Boardwalk’s proximity to the zoo the native plants selection had to be carefully crafted to avoid plants that could be poisonous to the animals. This past summer I the planting was impressive for such a young “garden” and it should look spectacular as it matures. During the class walks we saw several rare native plants, butterflies, frogs, birds and ducks that seem to be enjoying the effect of the Nature Boardwalk. On nice days you can spot turtles perched on rocks bathing in the sun. This summer a Northern Map Turtle made the south pond its home. While the changes to south pond may welcomed by gardeners, animals and insects some may think there’s room for improvement. “We came in one morning and discovered someone had jumped the fence and planted a willow tree at the edge of the pond,” said Houck with a laugh during one of the native plant gardening class walk around the Nature Boardwalk this summer. 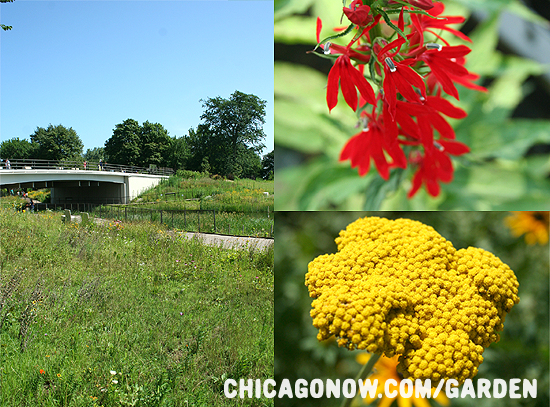 You can learn about the new programs at the Lincoln Park Zoo geared to Chicago gardeners on their website. There are fees associated with some of the workshops and classes but some, like the one garden planning this February, are free. Note: You can log into this blog and comment with your Facebook account. Follow the MrBrownThumb gardening blog or join my gardening page on Facebook. It is an awesome place to go. If you've never been to Zoo Lights I highly recommend it. Sheesh. I remember the South Pond very well, and not in a good way. There were options for paddle boats, and you could definitely take them, but the thing I remember the most was those underwater weeds. I don't know anything about what grows under 6 feet of water, but it wasn't good... like one of those movies where green vines leap out from the water to drag you to a watery grave. Who knows, they might have been native, but they weren't attractive. Hearing about this project makes me want to go back. The paddle boats are gone and I don't think they're ever coming back. I remember those aquatic weeds. They're still kind of there, but the crew does a good job of pulling them out regularly to keep them under control and allow the rest of the plants to get a foothold. Definitely go back next spring/summer as the plants will have filled in a lot more. The classes sound fun, and I'm going to have to check out the plantings if I make it to Chi next year!! That's fantastic! I'll definitely be checking out the re-do. MrBrownThumb, I enjoy your blog. You may like a poem I wrote about weeds on my blog. Check it out.